Based on the outstanding success of the Sidi Adventure Rain Boots, it has been decided that the full Gore-Tex version of the boot will be imported from Italy. Previously this boot was only available in Europe. 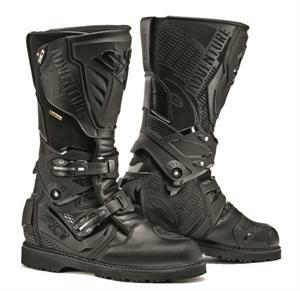 This ultimate adventure boot combines the best of both worlds (offroad and touring) into a boot that is extremely protective as well as comfortable both on and off the bike. With the Gore-Tex membrane these boots are 100% waterproof as well being highly breathable.